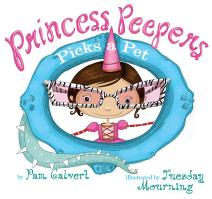 Check out Princess Peepers in the best selling sequel, PRINCESS PEEPERS PICKS A PET! If your little girl loves dress-up, glitter, and princesses, this is a book for her! It comes with special glitter embossing on the cover. Also, if your daughter doesn't want to wear her glasses, she will after reading this book! Now out in paperback and as an e-book! Princess Peepers is an Accelerated Reader title! A Scholastic Book Clubs selection! 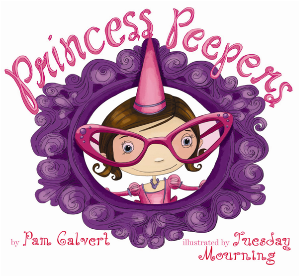 Princess Peepers loves wearing her glasses--until the other princesses at school make fun of her. What can Princess Peepers do? But that leads the princess into all kinds of trouble. Can she prove she doesn't need her glasses and get to the ball in time to dance with the prince? Find out in this hilarious story, as Princess Peepers changes the rules of cool around the castle! 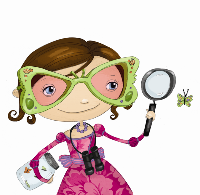 Kids love to make some fun eyewear just like Princess Peepers wears. Next, print it out on colored or white cardstock. Have your child color and decorate with crystals, jewels, feathers, whatever you want! Have your child put them on! MN State Best Read Aloud award! Mesquite ISD Texas Mockingbird award! LA Book Festival Award, honorable mention! Scholastic Book Clubs Reading Counts selection! Nevada Young Reader Award nomination! 2008 Cybils Picture book award nomination!